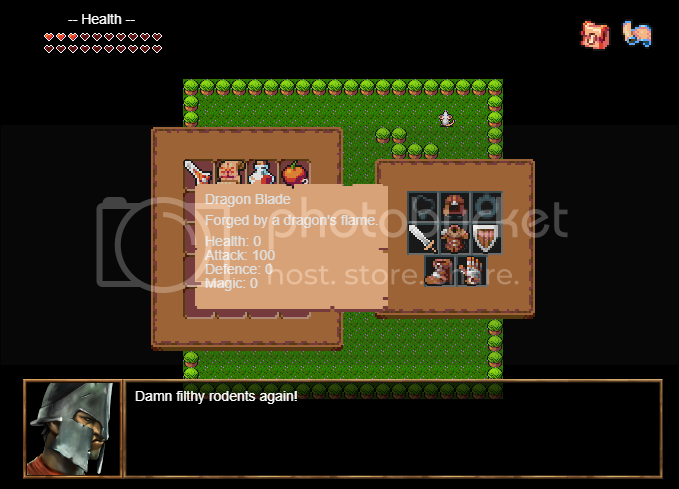 This project is a throw back to my first attempt at making a game with RPGToolkit 3 titled "The Last Sword Master", which is actually where my username came from. Sadly the TK version was not to be after I lost it to a computer virus way back when I was like 13. My plan is to remake the game using the RPGWizard, although I can't remember the exact story line it had something to do with Knights, Dragons, and oh yeah Ninjas because Ninjas (I don't know if they'll be coming back). At the moment I'm working on a sandbox environment for testing all the game mechanics, so far I have a simple ARPG battle system, moving enemies, and HUD for displaying the characters current health. 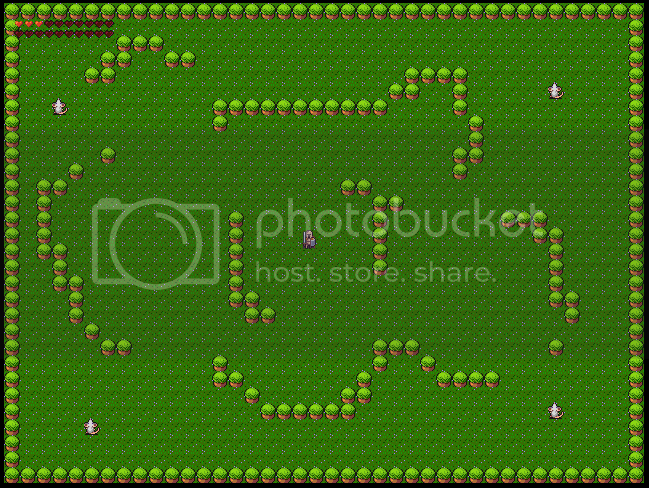 After I am happy enough with that I'll move onto to creating the game world and its characters. 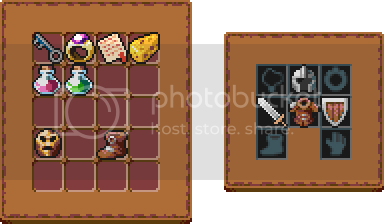 So I've managed to finish my inventory system, I can equip and unequip items, consume potions and food, and when the player hovers over an item it will provide them with a little description. It took me about 450 lines of code, which I've made as generic as possible since I plan to use this for the default system. Generic? You mean awesome. Looking great. Still some minor glitches with animations, but it is perfectly playable, there are a mix of enemies on the board, 2 of them are set up for passive bump interactions with the player, and the other 2 with actively seek out the player if they come into range. Moving between boards is a bit slow, I'll be looking to fix that though, also playing it via the site is slower than local play. I'll probably look into pre-loading more of the assets so there is a bigger up front loadtime but smoother board switching. The demo worked like a charm for me. The boss battle was my favorite part. I technically died. I'm glad there wasn't a game over screen in it. The message window in the beginning was neat as well. I still can't figure out how you did that or how you did the knockback effect. Amazing showcase! Awesome, I'm glad it worked The message window is fairly straight forward, the battle system took a while to get right admittedly. I've still got a few more things to add like projectiles, block pushing, and locked doors.